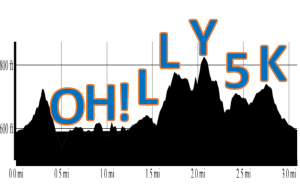 The inaugural running of the OH!lly 5K, part of the Charlottesville Summer Trail Running Series, was a big success! We had great weather, a superb start/finish location, wonderful race volunteers, and a total of approximately 115 runners! Wow! I want to let the pictures and race results do the talking (follow the links below).I will just say that I had a blast! Good job RD’ing David! Also great team effort to all CATs! Can’t wait for next year. Great team effort by CATs and so much fun seeing all the new faces! Next time, I’ll take 20-30 minutes for the description and employ teaching aids like illustrative charts. Maybe we could even have a course quiz before race start! And I agree, the best part was seeing all the new faces! Hope to see more at the next race! Eventually we’ll take them out to the Priest/3 Ridges and see who lives. I like that if you go through all the “powerlines” pics from start to finish, the smiles on the runners get progressively bigger. Something to be said for being a back-of-the-packer. I agree Paul. Lots to enjoy at the back of the pack!